New York, New York….It’s a Helluva Town! Wells takes the mound tonight for the Cubs. Last year, the rookie sensation caught fire and didn’t slow down, becoming the Cubs second most reliable pitcher behind Ted Lilly. This year, with Lilly starting the season on the DL, Wells is expected to continue his success and not suffer a sophomore slump. Once Lilly returns to the rotation (Saturday) there will be key decisions to be made regarding the 25-man roster and the starting rotation. Until then, there are a week’s worth a games to be played and the current five man must keep the ship together until Ted is back to help right it. Both the Mets and the Cubs are looking up at division leaders with 8-4 records. As expected, those teams are the Philadelphia Phillies and the St. Louis Cardinals. The Phillies are always a thorn in the Mets side and New York is going to have to figure things out quickly to stay in the race, even though the baseball season hasn’t even flipped the calendar page to May yet. They will look to start figuring things out against the Cubs tonight. The Cubs will hopefully face a tired and frustrated Mets team after their brutal series with the Cardinals this weekend which included a 20 inning marathon (the only game the Mets won over the weekend against St.L). The Cardinals are still the team to beat in the Central so it would do us well to win the series against the same teams the Cards win series against. I wouldn’t sweat Pittsburgh sitting above us in the standings just yet. Like I like to say here at Prose and Ivy, “We’ll Always Have Pittsburgh”. I believe that will again ring true in 2010. A great start is bound to fall apart for the Pirates. So far this season, Theriot is 1-for-11 against lefties which forces Lou to move Theriot to the eighth spot in the lineup. Although is production is down against lefties at the top of the lineup, considering he’s a guy who can get on base and is counted on to set the table for the bigs, for a number 8 hitter, even one who is struggling, we could do a lot worse. Nady hitting clean up isn’t something I’m thrilled with. I much prefer Ramirez in the clean up spot considering he’s a stronger power numbers guy and is healthier than Nady right now. Nady can’t do this every time they play lefties since he is still recovering from elbow surgery. However, considering they face a lefty pitcher three times this week against the Mets, you can figure I’ll see Nady in the line up in the 4 hold at least once. I don’t know much about Byrd’s record in the leadoff spot. He’s a level headed guy with a lot of potential and a quick start to the season so you don’t lose much productivity by replacing Theriot with Byrd there. If you have Nady hitting clean up, you don’t have Fukudome playing so he’s not an option there. Soriano is out and no one else makes sense. That might be more the reason why Byrd hits lead off in this line up. More of a process of elimination than anything really. When Sori’s not playing and Colvin is in the line up I’m not sure that he fits in the no. 6 hole quite as easily. He has shown great patience at the plate though and an ability to go deep so perhaps all Lou would have to do is write in Colvin’s name that day as opposed to Soriano and his line up is still good to go. I have a feeling I may see the answer to that scenario at some point this week too with the Cubs playing the Mets here in New York for what should shape up to be an evenly matched, intense, equally important to both teams, four game series. Likely pitching matchups for the next few games are as follows: Wells v. Niese tonight, Zambrano v. Pelfrey tomorrow and then Silva v. Perez on Wednesday evening. On paper, I like our odds and I can’t wait to see Silva in person. I’m surprised by his quick start to 2010. 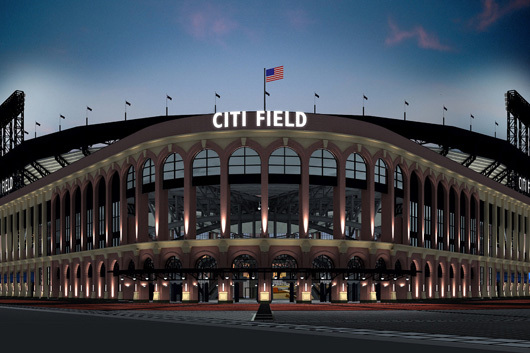 Looking forward to seeing the Cubs this week at Citi Field…I feel like the circus has come to town. Go Cubs Go! Let’s hope the combination of a new linup/playing the Mets can help us rebound from the miserable series against the Astros. Have fun at the games your attending, and hopefully you’ll be singing Go Cubs Go at Citi! ← The First ‘Prosecard from Cubs Nation’ for 2010 Is Here!